Since starting in 2010, Streetbank has attracted a fair amount of attention featuring in The Guardian, Observer, Huffington Post, on BBC South Today and as part of Kirstie Allsopp’s Fill your House for Free on Channel 4. We've also been rated by the Times as one of the "50 websites you can’t live without" and selected by the Observer as one of "50 New Radicals" of 2014 - organisations changing society for the better. Further case studies and information is available on request and our blog is regularly updated with our news and stories. Huck Magazine: Could you survive without any money at all? 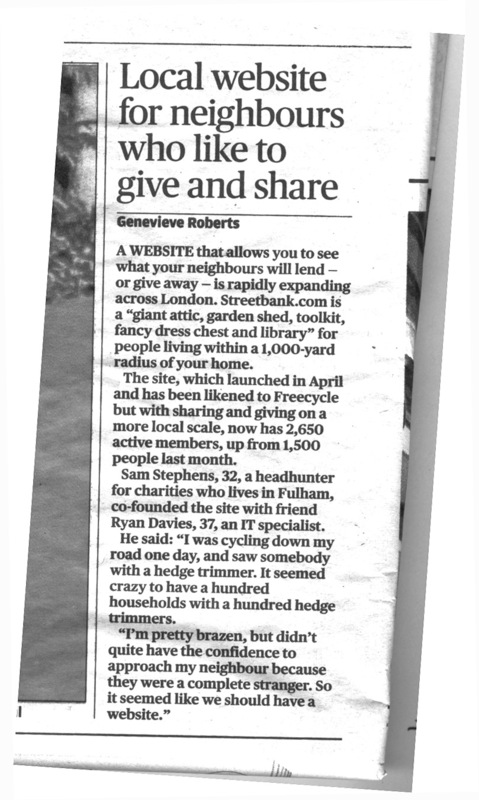 London Evening Standard - September 2010 - Streetbank.com is a "giant attic, garden shed and library"